L 7 1/4″ (18 cm). High “tsee-ee” or “tsee-titi.” Song is a weak twittering. Description: Several subspecies, but head pattern is distinctive in all: black “horns”, white or yellowish face and throat, and broad black stripe under eye; black bib. Generally brown above and paler below. Female is duller, and the horns are less prominent. Mostly black tail with white outer feathers and brown central feathers is conspicuous in flight. Brief juvenile plumage is brown above with white spotting. Habitat: Mostly found in natural grasslands and cultivated fields. Where in Nebraska: The grasslands of the Sandhills are probably a nearly optimum habitat. 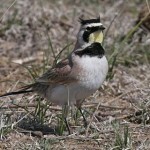 Common to abundant spring and fall migrant and summer resident statewide. Also common winter visitor. Several subspecies are present in the state at different times of the year. 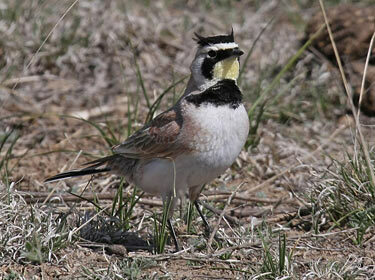 Fun Facts: Adult Horned Larks eat primarily weed and grass seeds, but they feed insects to their young.